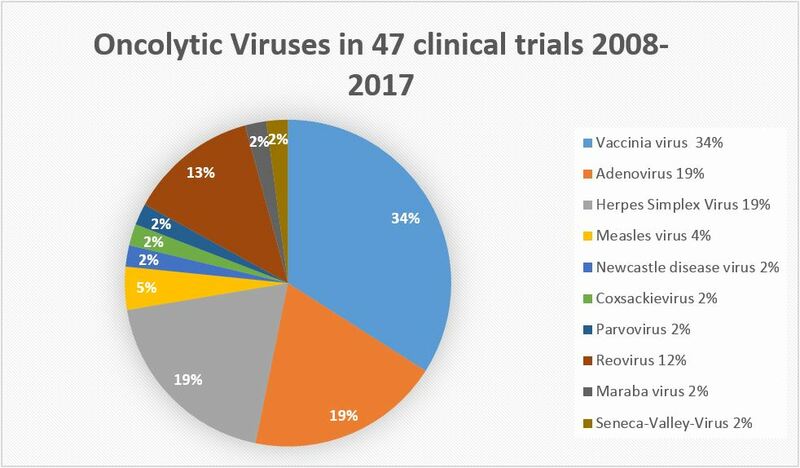 Over the last 20 years, the oncolytic activity of a dozen viruses has been characterized, and several have entered clinical trials. Most of them derive from modified human pathogenic viruses such as herpes simplex, adeno- and poxviruses, and possess large cloning capacities. This opens up the possibility of designing multifunctional virus-based products (therapeutic and imaging molecules) to be selectively expressed at high concentrations within human tumours. The initial idea of an oncolytic virus (OV) infecting the tumour and causing its eradication through successive rounds of infection-replication-oncolysis and reinfection, has turned to be rather idealistic due to limitations on the efficiency of intratumoural virus replication and spreading in humans and the presence of a large percentage of normal stromal cells within most tumours. These limitations are however not necessarily reflected in a poor oncosuppressive effect of oncolytic viruses. Indeed, apart from their direct lytic activity, these viruses have the capacity to trigger both the cellular and humoral arm of the immune system within the tumour, representing in this way the perfect vaccine adjuvant. (Figure 12.8). Oncolytic viruses would also support the release of neoantigens out of the tumour. These neoantigens additionally stimulate an immune response and thus support checkpoint blockade drugs. Checkpoints are generally stop signals for proliferating immune responses and are mainly based on ligand-receptor interactions. One major mechanism of immune resistance of many tumours is their hi-jacking of checkpoints. 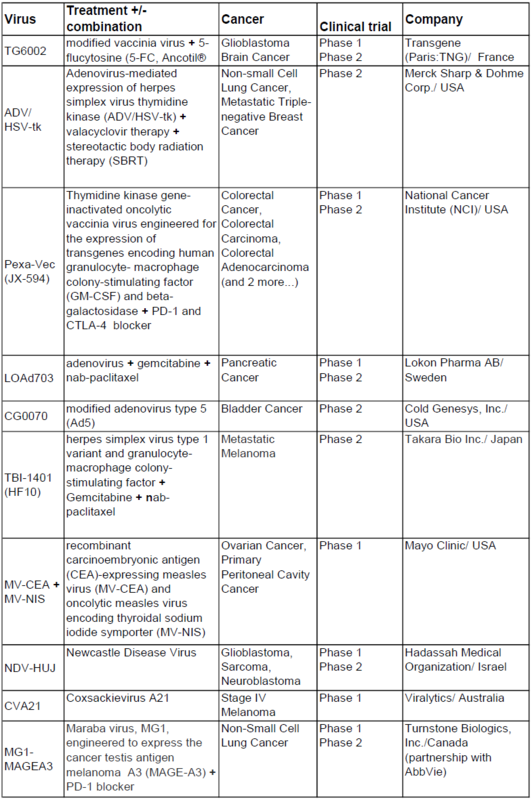 Therefore oncolytic viruses combined with checkpoint blockade drugs could be a powerful therapy. Dual role of immune system. The immune system plays a dual role in relation to cancer virotherapy. On one hand, it contributes to defend the organism against infection, thereby antagonizing OV activity. Most OVs trigger a cellular defense mechanism that involves the induction of type I interferons, and limits virus replication and propagation. This may not necessarily handicap OVs since IFN signaling is often impaired in tumour cells. The impairment is actually used to design OVs that are unable to block the interferon pathway and as a consequence replicate preferentially in tumours. On the other hand, this pro-immune microenvironment arising from tumour infection with OVs is also favorable to the activation of anticancer innate response, cross-presentation of tumour associated antigens and induction of tumour-specific adaptive immunity. 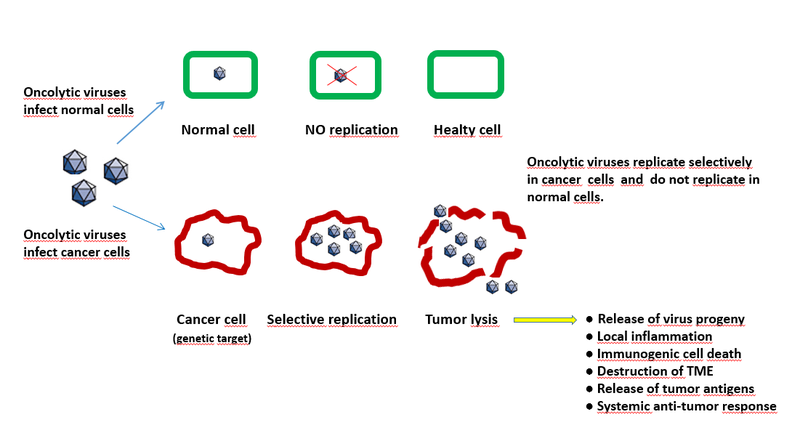 In this regard, oncolytic viruses may act as in situ personalized vaccine adjuvants by revealing the patient own tumour antigens to the immune system. This immune component of OV activity is especially important since it should contribute to the destruction of non-infected tumour cells which may represent the majority of malignant cells in an OV-treated tumour. It should also be stated that the immunostimulating activity of OVs can be enhanced by arming them with appropriate regulating motifs or transgenes. This can be exemplified by the herpes- and vaccinia-based OncoVEX and JX594 vectors supplemented with a GM-CSF-encoding transgene, which can be assumed to play a role in the recently reported ability of these OVs to affect metastatic cancers after i.v. inoculation. The first oncolytic virus was approved by the FDA October 2015 (T-VEC, Amgen) for the treatment of melanoma, and provisionally approved in Europe in December 2015. T-Vec is a genetically engineered herpes virus with an additional gene for human GM-CSF to promote anti-tumour immunity. The mode of anti-tumour action is not yet fully identified. That applies also to all other oncolytic viruses. A strong limitation of the viral approach is that the host's anti-viral counter-attacks often impair multiple-dosing regimens. Also pre-existing neutralizing antibodies against some viruses like reovirus, HSV, vaccinia, and measles virus, were found to be present in patients prior to treatment and the antibody titers increased following treatment. Also a „virgin“ virus so far unknown for the patient’s immune system will induce an antibody response upon repeated administration.